Digitalization in Recruiting—What Has Changed? We’ve been focusing on what has changed in the course of digitalization in recruiting. Which skills and methods today’s recruitment marketer must master, and which technologies have emerged in connection with digitalization that today’s recruitment marketer should capitalize on. Over the last few years, framework conditions in recruiting have changed drastically. The recruitment marketer’s job description has become much more comprehensive. Until today, companies could not completely adjust to this. All yesterday’s recruitment marketer had to do was place a job advertisement in a newspaper, and was then able to sit back and wait for the incoming applications. 10 years ago, the recruitment marketer was no longer just able to place his job advertisement in a newspaper, but already had to consider the job boards which were gradually popping up on the Internet. For today’s recruitment marketer, it’s no longer enough to just place a job advertisement and wait for the applications to come in. Today’s recruitment marketer must master a wide array of methods, and new technologies are needed in order to recruit successfully. Intense digitalization has taken place over the last 10 years. Subsequent portals and websites reflect digitalization, and they’ve developed rapidly, especially over the last few years. For example, SEO plays a key role. Make sure your job advertisements are search engine optimized so that you can be found in Google too. You therefore have the option of using Google as a free channel. However, there are many other activities that should be taken into account. For example, the development of an attractive career site, an interesting job advertisement, and the whole professional employer appearance, such as a professional job portal or professional job advertisements. By merging these single processes into one software, recruiting is structured more efficiently, evaluations are facilitated and comprehensive statements can be made. State-of-the-art recruitment marketing software bundles all recruiting activities into one tool. In this way, you maintain control over all measures and can achieve a continuous improvement process. It gives you all the tools and analyses you need to find, reach, and interest the applicant target groups that are relevant for you, and to then finally motivate them to apply for your jobs. Sophisticated software providers like Talention not only provide the software, but also strategic and technical support. The support assists you in implementing your recruiting strategy through to the evaluation of your analytics. Don’t worry—even if you still don’t have a clue about Recruitment Marketing, support shows you step by step how you can implement your measures with success. You’ll have a personal contact person who will take care of your success. 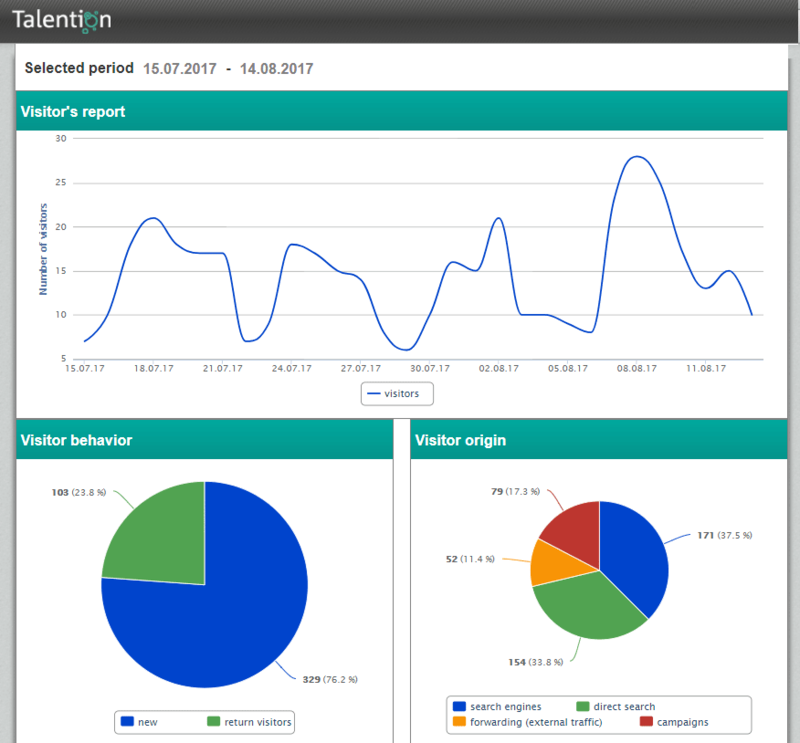 Talention provides you with all modules to implement successful recruitment marketing, and to conduct and evaluate the appropriate analyses. In a personal meeting, we’d be happy to show you how you can easily and quickly digitalize your recruiting. You can schedule a free demo here.